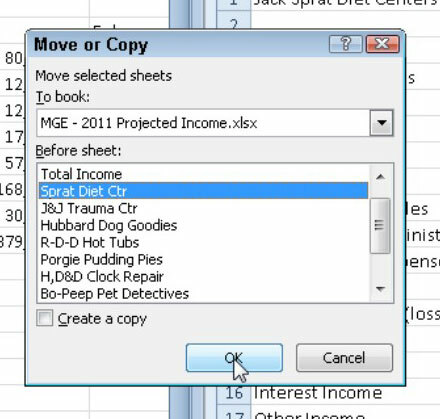 In Excel 2010, you may need to move or copy a particular worksheet from one workbook to another. You can use the Move or Copy dialog box to simplify the process. Open the workbook with the worksheet(s) that you want to move or copy and the workbook that is to contain the moved or copied worksheet(s). Display the workbook that contains the worksheet(s) that you want to move or copy. 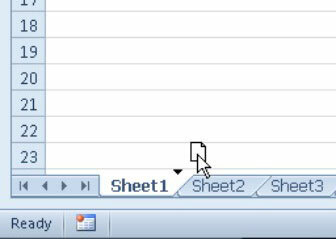 Right-click one of the selected sheet tabs and choose Move or Copy on the shortcut menu. In the To Book drop-down list box, select the workbook that you want to copy or move the worksheets to. Use the Move or Copy dialog box to move or copy worksheet(s) from the current workbook to another workbook. Select where in the new workbook you want to drop the worksheets. If you want to copy the sheets rather than move them, select the Create a Copy check box. Click OK to complete the move or copy operation. If you prefer a more direct approach, you can move or copy sheets between open workbooks by dragging their sheet tabs from one workbook window to another (hold down the Ctrl key as you drag a sheet tab to create a copy). Use the Arrange All command on the View tab to display all workbooks onscreen. Note that this method works with a bunch of sheets as well as with a single sheet; just be sure that you select all their sheet tabs before you begin the drag-and-drop procedure. You also can use drag-and-drop to move or copy a worksheet to another workbook.